Villeneuve’s negative series continues in the Federation Cup as they were crushed by Bourges Basket (47-80). 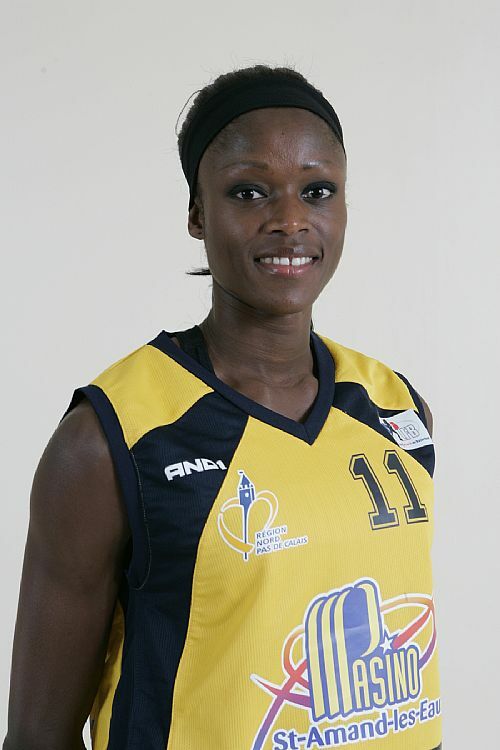 Villeneuve were without Bintou Diémé and Jucirama Dantas while Nora Bujdoso sat out the match for Bourges. Bourges opened the game with an 11-0 run and never really looked back. Villeneuve through Géraldine Robert made an attempt in coming back into the match to only trail by 4 points by the end of the first period (11-15). Villeneuve took the lead briefly during the second quarter (16-15). Then Bourges went on the rampage. By the interval they were leading by 16 points (36-20). Sonja Petrovic was the player of the first half with 10 points for Bourges Basket while Belinda Snell and Céline Dumerc (in picture) had also hit five three-pointers as they put behind the ghosts of the final four. Villeneuve offered very little for the rest of the game. Hence Bourges stretched their advantage (59-29) by the end of the third period and maintained it during a lively final period to win by a comfortable margin of 33 points. Cathy Melain from Bourges explained after the match that the 14:30 tip-off was a bit early for them. After their recent travels they were a bit tired but all happy to have qualified for the final. Kathy Wambe’s explanation for the defeat was simple: Bourges’ brilliant defence and her side’s inability to get into the match. Francesca Zara only shot from three-point territory and hit 5-of-6 as she led the scoring for USVO with 17 points. She also dished out 4 assists and made 2 steals. USVO opened the match with a 11-0 run as they dominated the early exchange. They increased their advantage to 13 points before Elodie Bertal came up with back to back baskets for Montpellier. USVO still led (19-10) by the end of the first period. Bertal continued to trouble USVO. By the time Gunta Basko got into the act with a trey, USVO’s advantage was only 5 points (25-20). Zara and Sabrina Reghaïssia put USVO back in control as they got their lead back to 10 points before being pegged back to 6 points at the interval (34-28). 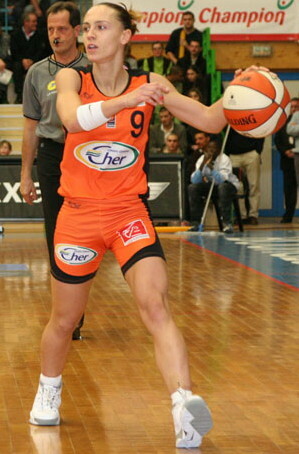 Grace Daley scored 8 straight points as Montpellier went in front for the first time in the match (38-36). USVO were to regain the lead briefly and then levelled the match (45-45) beforeGaëlle Skréla and Sandra Dijon gave Montpellier a 4-point advantage going into the final period (49-45). USVO went into overdrive at the start of the fourth quarter with quick points by Nicole Ohlde and Emilie Gomis to regain the lead (50-49). Sarah Michel then got in the act and by the time Zara and Ohlde completed the riot USVO’s lead was up to 6 points (57-51). When Zara hit her fifth trey of the evening USVO’s advantage had increased to 10 points (62-52). However Montpellier had not abdicated. With Aurélie Bonnan, Bertal and Daley all finding their marks USVO’s lead was reduced to 4 points (64-60). Ohlde was to miss a couple of free-throws. But Reka Czerny managed to get the rebound and started another USVO attack which she was to complete for her first points of the match. Montpellier was unable to get the basket and fell further behind after Michel scored her fourth point of the match (68-60). Dijon was to leave the game with her fifth foul with 18 seconds left. The way was free for USVO to qualify for the fourth consecutive Federation Cup final against Bourges Basket (70-61). Gomis said after the game that they had to win and be present. The match was difficult and they were all happy with the result. Whereas Bertal for Montpellier was philosophical in defeat and already thinking about tomorrow’s match. The Tournoi de la Fédération’s third place match will be played on Sunday, 20 April at 14:00 local time. The 99th official match between Bourges and USVO will follow at 16:30.